Secretive Commissions Determine Who Violated Anti-Discrimination Laws. Now Republicans in 1 State Are Fighting for Reform. Jenna Ellis is a constitutional law and criminal defense attorney, with experience in state and federal cases on both the trial and appellate levels. She is a professor of law at Colorado Christian University and director of the Legal Studies Program. Ellis is also a Fellow at the Centennial Institute and author of the book, "The Legal Basis for a Moral Constitution." 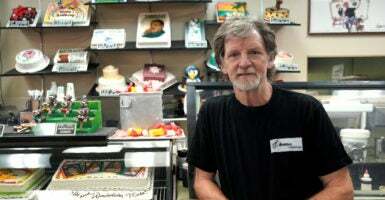 The nation has been transfixed with the story of Jack Phillips, the owner of Masterpiece Cakeshop in Colorado, and how the Supreme Court will hold in his landmark First Amendment case. But his story didn’t begin at the Supreme Court. It never does. As the highest appellate court, the Supreme Court reviews the facts and issues of law at the trial level. Usually, this means that a judge previously made some ruling, perhaps in the context of a jury trial or preliminary issues that come before the court. But Phillips’ case didn’t start out that way. He never saw a judge who was duly appointed in Colorado through the judicial merit system on the trial level, and he never had the opportunity to demand a jury. Instead, Colorado’s current system for claims of discrimination in public accommodations on the basis of sexual orientation go through the Colorado Civil Rights Commission—an agency of the Colorado Department of Regulatory Agencies. The seven members on its panel are not required to be attorneys or have any legal education. At least four of them (the majority) must be “members of groups that have been or might be discriminated against,” and per the commission’s own website, the proceedings are “confidential”—meaning that there is very little transparency or oversight regarding how the commission actually makes its findings of fact and conclusions of law. In Phillips’ case, a complaint was filed before the commission, which conducted its secretive investigation and hearings, and determined that Phillips was in violation of Colorado’s anti-discrimination law. This was followed by a closed proceeding before a panel, which very likely may have been biased toward claims being made on the basis of sexual orientation. In fact, during oral arguments at the Supreme Court on Dec. 5, 2017, Justices Anthony Kennedy, Stephen Breyer, and Sonia Sotomayor questioned the commission’s hostility and the comments from one of its commissioners. This raises the question: What else goes on in this Civil Rights Commission and other similar commissions across the country? According to the ACLU, Colorado is one of 21 states as of 2017 that has anti-discrimination laws on the basis of sexual orientation, and seven more states limit anti-discrimination claims to public employment only. What is particularly alarming about states like Colorado is that the Civil Rights Commission has virtually no accountability or transparency, with no ability for people who are defending against claims of discrimination to obtain meaningful due process through a judge or jury. Public perception of the commission on both sides of the political aisle is that the commission is biased toward LGBT community members, which is to say that the commission lacks legitimate public trust for being an independent arbiter. This type of required submission to an agency that is wholly administrative in nature (not judicial) deprives both parties of due process. Just last week, Justice Neil Gorsuch’s concurrence in the Supreme Court case Sessions v. Dimaya underscored the constitutional principle that administrative law often invites unpredictability and arbitrariness, which cuts directly against fundamental notions of fairness to litigants. So too, administrative agencies invite unpredictability and arbitrariness. After all, what the composition of a Civil Rights Commission may be today might vary widely from what the Colorado commission was in 2012 for Phillips’ hearing. There is no consistency in what is required for appointees and no form of oversight other than a court appeal on the merits. The Colorado Legislature is currently evaluating this exact question in the context of a legislative sunset review of the Colorado commission. This review process should act as a “job performance” evaluation of sorts, and seek to answer the question: Is the commission fulfilling the job for which it was created? Can it be more effective? Can it be enhanced? Can it be more transparent? Can it build more public trust through more legitimacy? Obviously, none of those questions should have a partisan response, and both sides of the aisle should be concerned with legitimacy in the process of arbitrating claims of discrimination. And this is about much more than just Masterpiece Cakeshop. The seven members of this commission are assigned to Colorado’s population of 5.2 million people. That’s one commissioner for every 800,000 people, who collectively represent a wide variety of viewpoints and trust that their government will not itself discriminate. Initally, Republicans in the Colorado Senate have proposed several amendments to the bill. Those amendments would reauthorize the commission in the area of public accommodation, including in making substantive changes to the appointments process, its transparency, reporting, oversight, and due process in the form of allowing both parties to “opt out” of the commission’s jurisdiction. These enhancements to the commission absolutely make sense. Not all claims are appropriate for the commission to hear (similarly to a judge recusal), and both parties should be able to go to a traditional judicial forum rather than an administrative agency if they wish, even if they later agree to mediate their dispute with the court’s oversight. For claims that parties agree to bring to the commission, it is always good to make the commission as prepared as possible to perform its job. Predictably, the LGBT lobby in Colorado is opposed to any changes to “their” biased commission, and testimony earlier this month before the Senate Judiciary Committee revealed this bias. Testimony from community members stated that “the commission has our back,” and other similar statements suggested the commission is not an impartial arbiter. As of this week, Republicans in the Senate dropped the opt-out amendment in favor of a bipartisan agreement with Democrats to provide two main enhancements: First, the commission would increase in size to nine members and appointments would have to maintain a 5-4 split between Republicans and Democrats; and second, the commission would be subject to legislative audit for purposes of transparency and accountability. This new amendment passed Monday morning by a vote of 35-0. Both parties in the Senate appear hopeful that House Democrats will support this bipartisan effort to enhance the commission’s legitimacy. Otherwise, the commission should not be reauthorized, period. States need to take a good, hard look at their administrative enforcement process, particularly for claims of discrimination. Impartiality, legitimacy, and due process matter, and they are constitutionally required. Hopefully, Colorado will pave the way for other states to use the legislative review process meaningfully and prove that equal protection under the law is something everyone should enjoy, not just some.